The Priceline affiliate program (or Priceline Partner Network) offers an extensive set of offers for travel and business affiliates. Join and gain access to 980,000+ properties and exclusive discounts through the platform. Begin promoting affiliate offers for flights, hotels, car rentals, cruises, vacations, and more. The Priceline affiliate program operates through several properties including Cheap Hotels, Agoda.com, Booking.com, Discount Rental Car, Discount Cruises, and Travel Guides. Affiliates can expect to earn 3% commissions for flight booking. Or, 3 to 7% commissions for hotel bookings. A 3% earning is also available when promoting vacation packages or car rentals. The Priceline affiliate program provides extensive copy and creative to improve earnings. 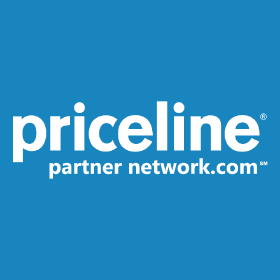 The Priceline Partner Network is a one-stop shop for all things travel. Travel and business affiliates will see viable commissions through the extensive support and deep linking to booking offers. We think Priceline is a perfect addition for travel blogs and websites because it gives you thousands of options and opportunities for monetization. The Priceline ecosystem encourages multiple offers from booking flights to vacation packages – these increases earning potential. There are competitors like the Expedia program, but Priceline does an ample job to compete on their level. This is a program ideal for those travel and business affiliates wanting to cast a wide net with promotions and offers since it covers everything. In all, we think adding Priceline affiliate offers and promotions present a win/win scenario. You gain 3% baseline commission with nearly every offer while visitors receive stellar service and pricing. Priceline, by far, is one of your better options when monetizing a travel blog.